Before I was diagnosed as a Coeliac, I used to absolutely adore Chicken Kievs. They were the perfect comfort food and with a bit of a soft spot for garlic-y food, they were a wonderful treat! For years I pined over them, and then suddenly, last year, I found these: Sainsbury’s Free From Garlic Chicken Kievs, hiding in the frozen aisle. One bite, and I was transported back to my childhood. They looked somewhat flat for a kiev, but I decided not to let this sway me and when I cut them open, they looked yummy. Although they lacked the oozy, butteriness that I remember from standard kievs, these were a pretty good comparison. The meat was moist, the breadcrumbs not too heavy and there was plenty of garlic! 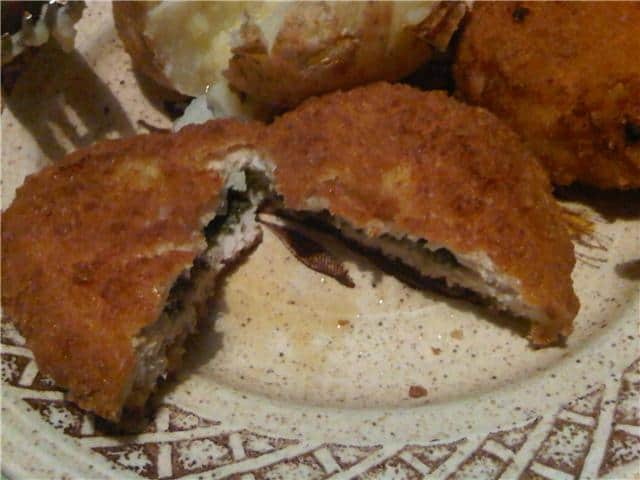 Although I don’t think anything could ever beat proper chicken kievs, I will definitely buy these again because they were a pretty good attempt. Next Post Back to Uni…Time for Ready Meals! That was a lucky find! I’d love to get a few of those for an easy dinner for my son. What was the brand if you can remember ? It was Sainsbury’s Free From range, I have updated the page and added a link to the product, hope this helps!